● Health hero or dietary baddie? ● Can palm oil be truly sustainable? Few crops generate as much controversy as oil palm. Acting as a major driver of economic growth in many developing countries, such as Malaysia, its controversial production is known to contribute to deforestation, peat degradation, biodiversity loss, species extinction, climate change and social issues. Palm oil is extremely versatile, making it suitable for myriad uses in food, personal care products and biodiesel. Its use is so embedded that as many as 50% of the products on our supermarket shelves are found to contain it. However, consumers are increasingly alive to the environmental costs as well as being concerned about the health effects – and this has led to increasing calls to avoid products containing palm oil. As ANH-Intl directors Rob Verkerk and Meleni Aldridge head out to Malaysia to speak at the Inaugural Integrative Medicine Conference in Malaysia this coming weekend, we look beneath the surface of this complex and controversial issue. Figure 1. Uses of oil palm byproducts and biomass in food and manufacturing industries. Source: Sheil et al 2009, CIFOR. Compared with other oil seed crops, oil palm (Elaeis guineensis) is a highly efficient, high yielding and cost-effective crop. While a native of West Africa, Elaeis guineensis, has found a new home with ideal growing conditions in Indonesia and Malaysia allowing these countries to dominate the world’s palm oil production. As a result, both countries have fully exploited their natural resources in order to expand production to bring much needed income and development to their economies. Composed of a fleshy outer (mesocarp) and inner kernel (endocarp), palm oil has been consumed by humans for thousands of years. Palm oil (PO) itself, sometimes also referred to as palm fruit oil, comes from the pulp of the fruit (the mesocarp). Inside the fruit is a large kernel (endocarp) which yields palm kernel oil (PKO). 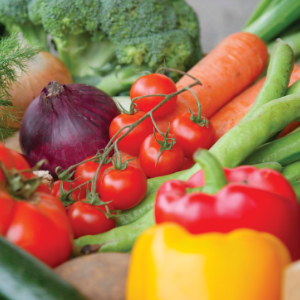 Comparatively, most crude PO is used in foods, whereas PKO, which is closer in composition to coconut oil, is still more widely used in products not destined directly for human consumption such as cosmetics, animal feed and a wide range of industrial uses. Fractionation of the oil produces palm olein, the liquid component, and palm stearin, the solid part of the oil (obtained from both PO and PKO). Figure 4. Oil palm plantation, Malaysia. Source: Wikimedia. Health hero or dietary baddie? Largely due to its high saturated fat (especially palmitic acid) content (Fig 5), palm oil has often been criticised as an unhealthy fat. Unlike many other plant oils, however, palm oil is semi-solid at room temperature, so it doesn’t need to be hydrogenated and therefore generally doesn’t contain damaging trans fats. However, in order to make palm oil palatable to consumers, it commonly undergoes further processing, which may significantly reduce its health benefits. Figure 5. 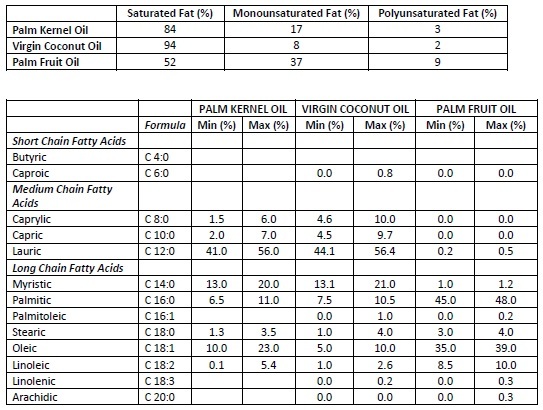 Comparing the fatty acid content of palm oil, palm kernel oil and coconut oil. The bottom line is that palm kernel oil (PKO) – the form that has historically been used mainly for cosmetics, animal feeds and industrial purposes, appears to have a fatty acid profile that is considerably more healthy than the palmitic acid rich palm oil. PKO is is particularly rich in MCTs and lauric acid, with a saturated fatty acid profile similar to virgin coconut oil (Fig 5). This science has led to the development of palm kernel butter by SIRM in Sweden as a health product now brought to consumers by PKO protagonist, clinician and organiser of the Inaugural Integrated Medicine Conference in Malaysia, Dr Janethy Balakrishnan. Dr Balakrishnan has accumulated patient data over a number of years showing very clear health benefits. She and nutritionist husband, Nils Bokstrom are staunch supporters of the Round Table on Sustainable Palm Oil (RSPO) and are fully committed to using palm oil from sustainable sources that complies with RSPO standards. Find out more about the RSPO, its organisation, principles, mission and membership. Palm kernel oil aside, there is also good evidence that micronutrients contained in palm oil, such as carotenoids and other antioxidants and vitamin E tocotrienols, have multiple benefits on neurological and cardiovascular health. The steady growth of the palm oil industry has already racked up a heavy cost to the environment with swathes of virgin rainforest being destroyed to accommodate large monoculture plantations. The European Parliament has shown great concerns over the environmental impacts of palm oil in Indonesia and Malaysia and instigated two resolutions that will have effect if passed by the European Council and Commission. The proposed bans are about imposing a single certified sustainable palm oil scheme for Europe-bound palm oil exports after 2020, and to phase out palm oil from the EU biofuel program by 2020. The threat of the impending bans on non-sustainable palm oil have raised many an eyebrow in South East Asia, as shown by this opinion piece just published in Malaysia. It is clear that large-scale plantations are often unsustainable and very low in biodiversity. But there are other ways of cultivating oil palm, particularly by smallholder farmers, that don't involve destroying rainforests and eliminating biodiversity but that would mean cutting back on the land area presently being cultivated for palm oil. Supporting the EU Parliament's proposed biodiesel ban is good starting point. Stepping into the fray to prevent further deforestation and environmental destruction is the RSPO, its primary mandate being to make sustainable palm oil the norm. Its standards are not without critics though. As pressure is brought to bear on producers in Indonesia and Malaysia to switch to sustainable production systems, initial good intentions could result in unintended consequences to food security and local development that are not always taken into account. Presently only around 19% of palm oil is certified by the RSPO globally. While fire is widely used to clear forest, RSPO does not allow fire to be used on its concessions, and it aims to reduce use of fire more widely. Pushback is also coming from the producers as they turn their attention to new markets that don’t share the same environmental concerns as the EU or North America. Palm oil use is ubiquitous in foods and a rash of every day products. As demand for cheap vegetable oil is unlikely to reduce, it is clear that the demand for palm oil is unlikely to decline given its yields and economic viability. There is a great need however to keep pushing forward with sustainability and as the RSPO experience shows, smallholder farmers are much more likely to meet sustainability requirements than large agribusinesses. Left to their own devices, large palm oil companies are likely to take the cheapest, easiest route, even if it’s illegal or at the expense of the environment. Here is a short list of things you can do to help. We, as consumers, must demand better labelling of products to show the origin of the oil, and choose sustainable options which will encourage companies to prioritise transparency in their supply chains. We should be able to separate palm oil, along with its type and degree of refinement or processing, from kernel oil. We should also know the sustainability of the source oil seed and the supply chain. Check out the WWF’s Palm Oil Buyers’ Scorecard to find out which companies are taking action, could do more or are doing nothing at all. Don’t boycott palm oil or at least palm kernel oil per se. Use the RSPO app to help you identify products containing sustainably produced palm oil and palm kernel oil to encourage better production and avoid pushing demand onto less sustainable oils elsewhere. Thanks for reading to end of this article! We are donation funded and would be grateful if you would consider making a contribution to support our work. "both countries have fully exploited their natural resources in order to expand production to bring much needed income and development to their economies." Might it be that 'developing nations' are tricked, forced or via corrupted or puppet leaders delivered into debt (Aid) that translates as loss of rights over natural resources and governance to interest payments that only grow, forcing the sacrifice of health and wealth to keep up terms and conditions of colonialism by stealth. There was a documentary on palm oil and orang utangs that I saw once on Al Jazeera that really deserves a wider audience. I had a search but did not find it. The impression it invoked was of an alien machine consciousness landing on Earth and sucking it dry of life. Excellent information, thank you. This appears to be the first steps in a long haul of complete revision of palm products. I will do my research and buy only certificates products. I cook with Coconut oil and don't buy personal care products from big commercial companies, a mere drop in an enormous ocean! It is interesting to learn that "Cheddar man" was lactose intolerant! This was mentioned on the BBC news yesterday. Thanks for this illuminating debate - will follow with interest and share within my group.